Revlon Colorsilk Beautiful Color #11 Soft Black. Get natural-looking hair from root to tip with Revlon ColorSilk Hair Color. 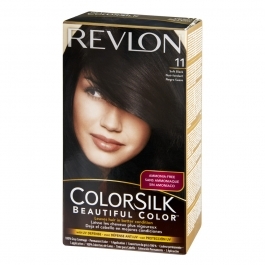 This Revlon hair color lasts longer and leaves your hair in better condition. Plus, it's completely free of ammonia. The hair dye gives you radiant color with lots of shine and 100% gray coverage. You'll love the way your hair looks when you use this ammonia-free hair color. Please see packaging for full details. Follow directions for best results. Ammonia-Free Colorant: Aqua ([Water] Eau), Oleic Acid, Isopropyl Alcohol, Ethanolamine, PEG-2 Soyamine, Lauramide MEA, Lauryl Pyrrolidone, P-Phenylenediamine, Sodium Laureth Sulfate, Sodium Sulfite, Parfum (Fragrance), Laneth-5, Sodium Benzotriazolyl Butylphenol Sulfonate, Wheat Amino Acids, Potassium Cocoyl Hydrolyzed Collagen, Buteth-3, Tributyl Citrate, Erythorbic Acid, Tetrasodium EDTA, 2,4-Diaminophenoxyethanol HCl, Resorcinol, M-Aminophenol, Linalool, Citronellol, Geraniol, Coumarin, Amyl Cinnamal. Cream Color Developer: Aqua ([Water] Eau), Hydrogen Peroxide, Cetearyl Alcohol, Ceteareth-20, Steareth-10 Allyl Ether/Acrylates Copolymer, Amodimethicone, Sodium Lauryl Sulfate, C11-15 Pareth-7, Laureth-9, Glycerin, Trideceth-12, Disodium Phosphate, Phosphoric Acid, Methylparaben, EDTA. After-Color Conditioner: Aqua ([Water] Eau), Cetearyl Alcohol, Behentrimonium Chloride, Linoleamidopropyl Dimethylamine Dimer Dilinoleate, Stearyl Alcohol, Cetyl Alcohol, Stearamidopropyl Dimethylamine, Amodimethicone, Methoxypropylgluconamide, Pyrus Malus (Apple) Fruit Extract, Silk Amino Acids, Hydrolyzed Silk, Panthenol, Panthenyl Ethyl Ether, Trideceth-12, Cocamidopropyl Betaine, Ceteareth-20, Cetrimonium Chloride, Isopropyl Alcohol, Isostearyl Glycolate, Triisostearyl Citrate, Diisostearyl Malate, Isostearyl Lactate, Dimethicone PEG-8 Meadowfoamate, Hydroxyethylcellulose, Diisostearoyl Trimethylolpropane Siloxy Silicate, Parfum (Fragrance), Hexyl Cinnamal, Linalool, Citric Acid, Methylparaben, Propylparaben, Methylchloroisothiazolinone, Methylisothiazolinone. This product contains ingredients which may cause skin irritation on certain individuals and a preliminary test according to accompanying directions should first be made. This product must not be used for dyeing the eyelashes or eyebrows; to do so may cause blindness. Hair colorants can cause severe allergic reactions on certain individuals. Read and follow instructions. Temporary black henna tattoos may increase your risk of allergy. The preparation may cause serious inflammation of the skin in some persons. A skin allergy test must be completed 48 hours before you use this product, even if you have used coloring products before. Buy the product in advance to allow for the 48 hours allergy test. This product is not to be used on children. Safety Instructions: Do not color your hair if: you have a rash on your face or sensitive, irritated and damaged scalp; you have ever experienced any reaction after coloring your hair; you have experienced a reaction to a temporary black henna tattoo in the past. Wait at least 14 days after relaxing, bleaching or perming before coloring. Avoid contact with eyes and rinse eyes immediately if product comes into contact with them. Wear suitable gloves. Rinse hair well after application. Keep out of reach of children.